"the solution for a good nights sleep for baby and all." Family owned, developed by a mother, grandmother. 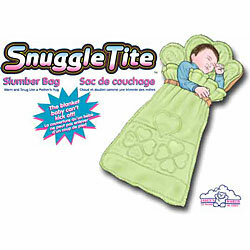 SnuggleTite Slumber Bag, the blanket baby can't kick off, warm and snug like a mother's hug, for baby's comfort and a parents peace of mind, the only blanket baby will need. Because when baby sleeps soundly then so will the rest of the family. SIDS foundation, the US Safety Commission, American Pediatrics Association and Canada Health recommend using baby sleeping bags over loose blankets. Using straps and clips for easy and comfortable tightening around the child, ensuring the child won't kick the blanket off, slip down under the covers or get tangled up in loose bedding. With its unique design, allows room for a child's growth and is easily zipped open for use as a regular blanket. 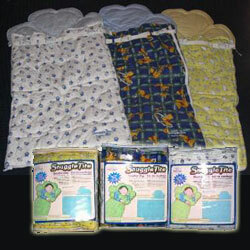 The pillow pad provides a clean surface for a newborn, ensuring that the babies head never touches the floor, couch or change table in a public restroom. Removable for an older child. Two way zipper, for easy diaper change without having to remove the baby from the bag. Made from 100% cotton outer shell, with high loft polyester fibrefill. Great at the cottage, boating and camping for those cool nights. Great for when a snowsuit is too heavy, a sweater and the slumber bag is all baby needs. The Slumber Bag won�t slip off and get caught up in the stroller wheels. Practical choice for summer use with air conditioned homes and for winter, allowing for thermostat adjustment saving on heating costs. Specifically designed for infants and toddlers, is a safe alternative for loose blankets and will make putting baby to bed an enjoyable experience.